At the end of semester 2001A the Small Fibre Module (SFM) will be commissioned. The SFM will be located at the prime focus of the William Herschel Telescope. At prime focus the fibres are placed at user-defined sky coordinates by the robot positioner AUTOFIB-2 (AF2). 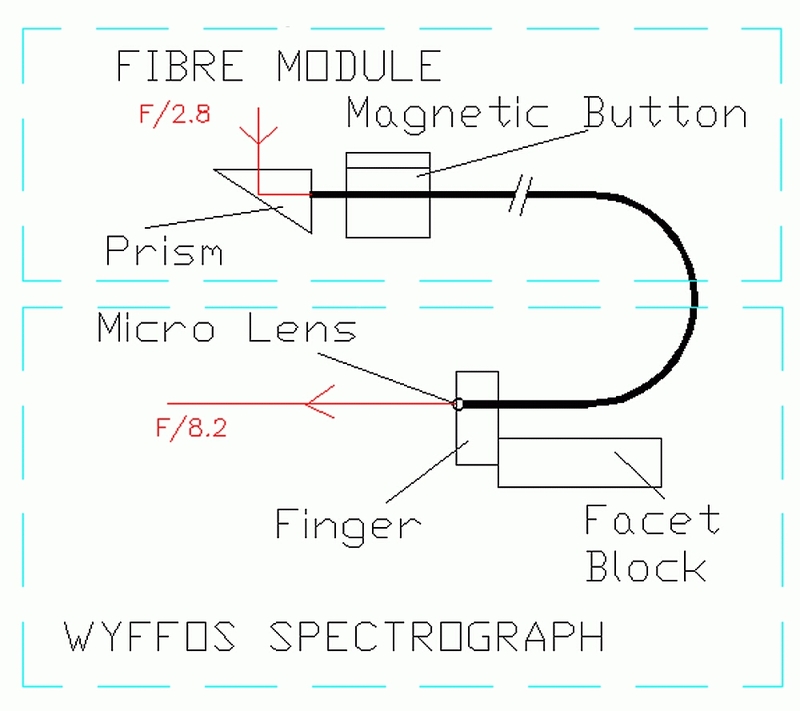 Object light collected at prime is transmitted along fibres to the Wide Field Fibre Optic Spectrograph (WYFFOS). The SFM unit will replace the existing Large Fibre Module (LFM). The SFM is currently under construction at the ING. Fibre assembly and alignment is being done in the optics laboratory at our sea-level base and the fibre module is being manufactured in the ING mechanical workshop. 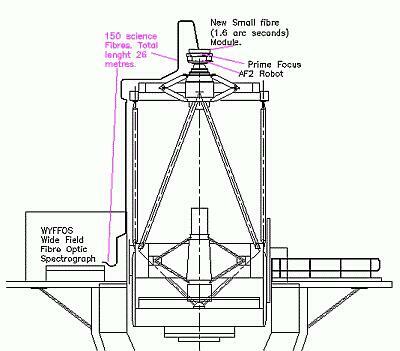 The path from prime focus to the spectrograph consists of a prism, fibre button, 26 metres of fibre, finger, microlens and the facet block. The fingers and facet block have been re-designed and manufactured to accommodate the new layout of 15 fibres for each finger with a total of 10 fingers mounted onto the facet block. The fibre module unit has been modified and now incorporates extra struts. These struts reduce flexure and support the direct mounting of the new field plate. The new field plate is thicker to avoid distortion. The SFM will feature 150 science fibres of 1.6 arcsec diameter (90 microns). The fibres are high-content OH fused silica made by Polymicro. This is the same material as those of the existing LFM. Unlike the current large fibres, they will run as one continuous stretch from AF2 to the WYFFOS spectrograph, i.e. 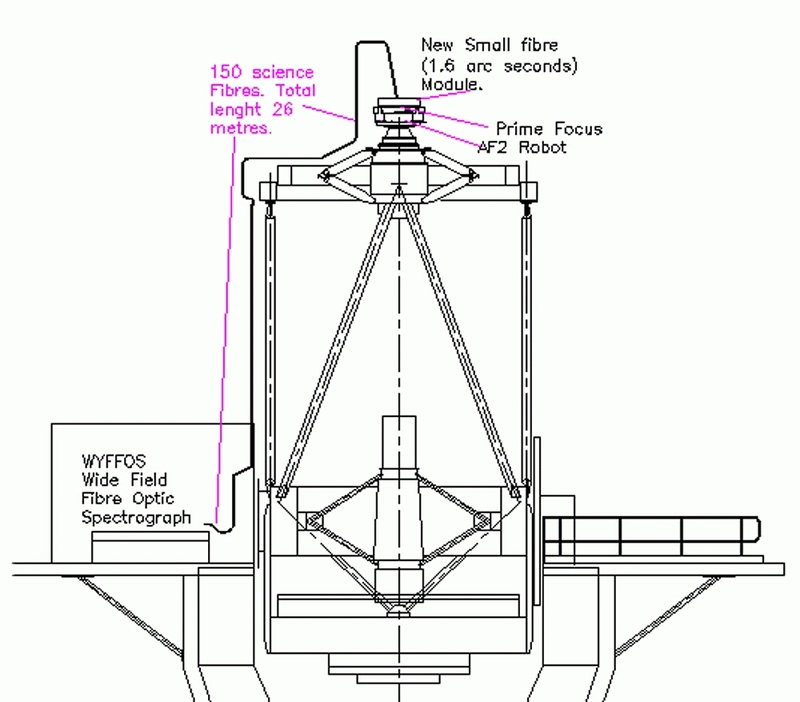 run without fibre connectors at the top end of the telescope. The SFM will be stored on the telescope when not in use and the mechanical engineering group is currently designing a support frame, which will mount on the side of the top end ring. It is our intention to incorporate a comparison lamp in the storage frame, which will allow quality checks to be made even when small fibres are not on the sky. Astrometry, acquisition and guiding are more critical with smaller fibres. Therefore the SFM guide fibres are to be enhanced. The existing semi-coherent fibres containing 7 individual fibres are to be replaced with fully coherent imaging fibre bundles. Selection and testing of a suitable coherent fibre is in progress. Two sample fibres are currently being tested for flexibility, resolution and throughput. A balance between the number of fibres in an imaging bundle and the core diameter of each individual fibre is required in order to get sufficient resolution and maintain required throughput. These bundles will feed an intelligent TV system that, in time, will provide autoguiding; the current large fibres system still relies on hand guiding. The coherent images of several fiducial stars will allow accurate acquisition and guiding of the science field. Increasing the number of science fibres from 110 to 150 will increase the number of field permutations. The maximum packing density is still the same as this is constrained by the fibre buttons and gripper jaw size. However, the packing density, known as the buffer factor in the configuration software, will be optimised now that the gripper unit is reliable. A reduction in the overall set up time of astronomical fields is to be achieved by increasing Z speed on the AF2 robot gripper and by reducing the placement iterations of each individual fibre. At this stage we cannot quantify the gains we will achieve yet. The 150 science fibres of the SFM will have better performance than the fibres of the LFM: no light loss due to fibre connectors, and less sky contribution in the fibres. It is difficult to estimate the throughput gain due to the lack of fibre connectors. From our experience with large fibres we know that the connectors give rise to attenuation of the throughput of some but not all fibers. The new system will provide a more homogeneous distribution of fibre throughput, and on average may be 50–100% more efficient than the old system. The ratio in sky area sampled by fibres in the small and large modules is 0.35. This means that noise levels in sky-limited observations will be down by a factor of 0.6, without accounting for other sources of throughput gain. The small fibres will be imaged onto less than 2 pixels (FWHM) on the Tek 6 detector in the spatial direction. The full spatial image of the fibres will be sampled by less than 3 pixels. There may be a slight gain in S/N of the extracted spectrum with respect to the large fibre case, as less pixels will have to be extracted when sampling the wings of the spatial profile. For small fibres, the fibre distance in the WYFFOS entrance slit will be 1 mm, which transforms onto a peak-to-peak aperture distance of 6.7 pixels on the detector. The nominal spectral resolution will increase as the ratio of large to small fibre diameters, although this number is limited as the detector will also undersample in the spectral direction. We expect the highest resolution to be around R~7500 in echelle mode. The 1.6 arcsec fibers were chosen as a compromise between minimum sky contribution and maximal source contribution. As the positioning, pointing and (automated) guiding errors may add to 0.5 arcsec, there will be no room anymore for astrometrical errors. Field setups that suffer from inaccurate astrometry or an insufficient number of fiducial stars may suffer light losses of more than 50% at the fibre entrance. We caution future observers about this effect, as bad astrometry may cancel all the gains that the new SFM will offer. Information about AF2/WYFFOS can be found at: http://www.ing.iac.es/Astronomy/instruments/af2/index.html.